Below you will find Solar Decathlon news from the Netherlands archive, sorted by date. 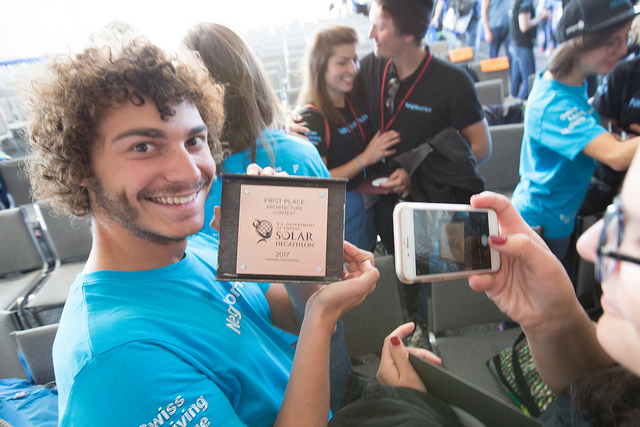 And Now … Winners of the Official Unofficial Solar Decathlon Contests! If you read our They Build Through Rain, Sleet, Snow or Hail blog post, you’ll know that weather is officially Solar Decathlon’s unofficial 11th contest. And we pretty much had it all—rain, sleet, snow, wind, and lots and lots of mud. It was the first time Solar Decathlon has ever seen snow, and good news—no hail! For the Weather Contest, we’re happy to report an 11-way tie. All 11 teams completed their houses, opened to the public, and participated in the competition. At the writing of this post, only two-tenths of a point separate first and second place in Solar Decathlon 2017. We are six days into the competition, and there are three days left. Cash prizes up to $300,000 for the winner. And bragging rights of course (priceless).